"I am very impressed, you did a great, great job!" I am glad to welcome you in my new shop in Vienna, Austria. 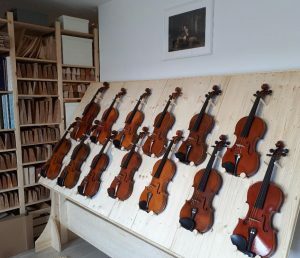 Now heaving larger premises available, I have broadened my activity spectrum and I have assembled a very fine collection of contemporary violins, violas and celli made by fellow makers from Cremona – all available for trial and sale. Also, some very fine modern bows! 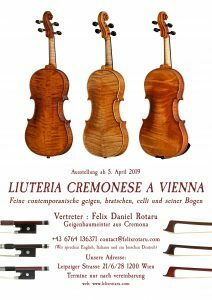 These wonderful guests won’t stay long in Vienna as this is a special event; starting now until the end of June 2019, I gladly invite you to come see and try them! For appointments please write me a mail or call me at my new austrian phone number, the Contact page is updated.